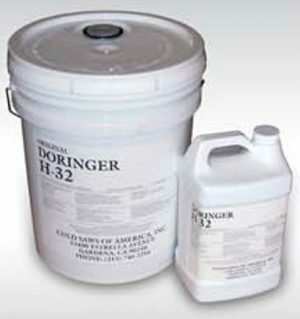 ORIGINAL DORINGER H-32 Coolant was developed and is manufactured specifically for chip making machinery and cold sawing. H-32 is a synthetic coolant offering maximum lubricity and cooling quality. The coolant conducts the heat of sawing keeping the sawblade cool to ensure maximum blade life, and keeping the work piece cool ensuring no distortion, discoloring, and ease of handling. The synthetic H-32 requires no degreasing. Mix coolant with water 6:1 for light cutting, 3:1 for heavy cutting. Check with factory for proper ratios for other applications. E.P.A. approved. MSDS provided with each order. 1 & 5 gallons shipped via UPS. You have already added this product. Change QTY or add a different product.